T-34 is a 2018 War Drama Adventure Action movie directed by . It stars Alexander Petrov, Victor Dobronravov, Irina Starshenbaum, among others. 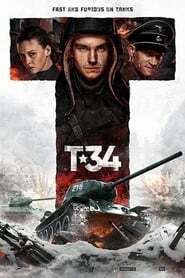 T-34 is currently rated 4.8 stars on the ReelBugs scale. Just because its not made from your country you dont think its good.. dumb heads..
Just saw it. Very well made. Just make sure you suspend your disbelief and watch it as an action movie. Wanna see!!! And about Russia not making great movies? I beg to differ. Dam...one of the best movies ive ever seen. Can’t wait for a US release, this looks EPIC!! Nice to see all the "muricans" crying in the comments jajajajajjajajajaja.